Product BenefitsTo increase joint mobility, training recovery, rehab and stretch. 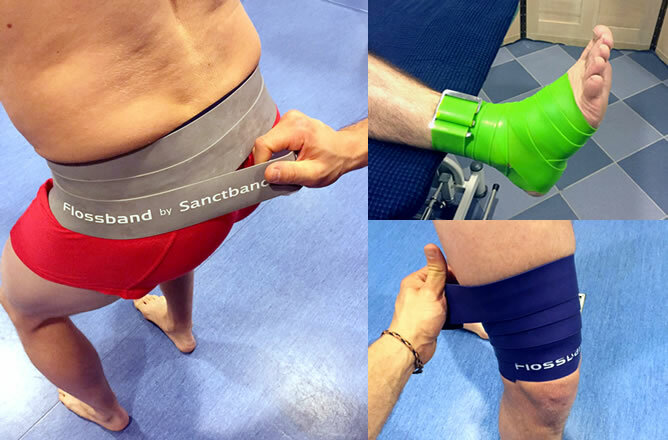 In collaboration with the renowned sports physiotherapist Sven Kruse, we developed a flossband set comprising of 4 different strengths based on the EASYFLOSSING-concept. The different resistance levels allow the generation of specific application levels for a differentiated stimulation of various deep tissue layers, just as it takes into account the different tolerance limits of patients. Through various application possibilities, compression is exerted on the muscles by the band. The high fixation pressure enables an inhibitory effect on the pain receptors and underlying fascia and thus loosens up the adhesions and weak links. This takes place under active and passive movement of the extremity on which the band is wrapped. When the floss band is released, the fluid or blood stasis ("traffic jam") is terminated and fresh blood hydrates the tissue (so-called sponge technique). This leads to the relief of different types of pain. Flossing can be used preventively before and after sports. It is also a useful treatment method in physiotherapy. The therapist "flosses", when pain restricts the movement of the athlete or patient. Flossing improves the body’s power transmission pathways: it generates more power in the tissue, improves viscoelasticity and requires less energy for mobility because of axial transmission through the body leading to more efficiency. Due to the resultant pain relief, patients and athletes are able to move significantly better and faster, without resorting to pain relieving postures.